The Anker SoundCore Bluetooth Speaker is one of the best wireless speakers on the market. It is very portable due to its small size. In fact, it has a high sound quality that suits a speaker twice its size. BOTTOM LINE: This speaker has a very long battery life and decend sound quality at full volume. If you are on the budget, this is a speaker for you. You can find a lot of cheaper Bluetooth speakers on the market these days than the Anker SoundCore, speakers with more features and better design. But Anker Soundcore is aiming big. It pumps out great sound and has enough battery power to last all day. And has over 6k positives reviews. With the Cambridge SoundWorks OontZ Angle 3, the Anker Soundcore is perhaps the best budget portable speaker you can find on the Amazon. The Anker SoundCore Bluetooth Speaker is a compact portable Bluetooth speaker you can throw in your bag and take anywhere with you. It uses the Bluetooth version 4.0 and has a driver output of 3Wx2. So, it is compatible with all devices that are Bluetooth-enabled. We like it because it connects automatically to the last device that was initially connected. We also enjoy using the built-in mic whose functionality is receiving calls. The design of the Anker SoundCore? It is in a rectangular layout, and the chassis is of soft plastic. The front of the speaker is a grille. The brand name Anker is written on the grille and at the back. On the front of the speaker is a small LED light the flashes blue when the speaker is connecting. The LED light will also alert you when the battery is low. It glows red if the battery gets low. The design might be simple, but it looks very executive and unique. Overall the Anker SoundCore is a well-constructed, tiny and very portable speaker that easily fits in any laptop carry case. The unit is really easy to connect. 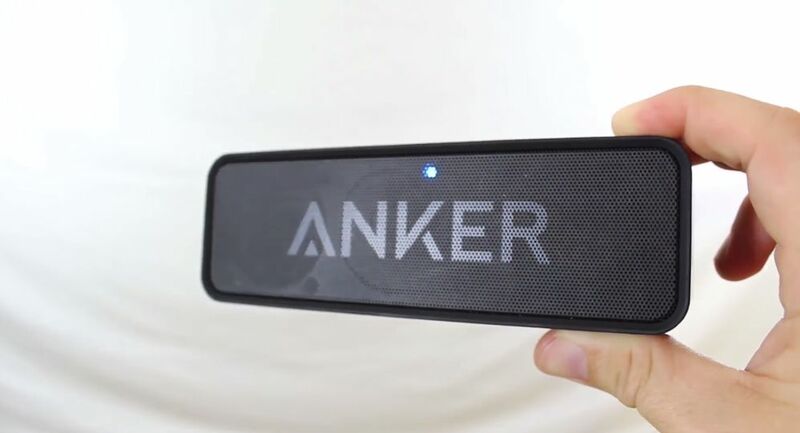 You can instantly connect the Anker SoundCore Bluetooth Speaker to your smartphone or tablet from up to 66 feet away and great is that the unit can reconnect automatically to the last device used. This is a category where the Anker excels. 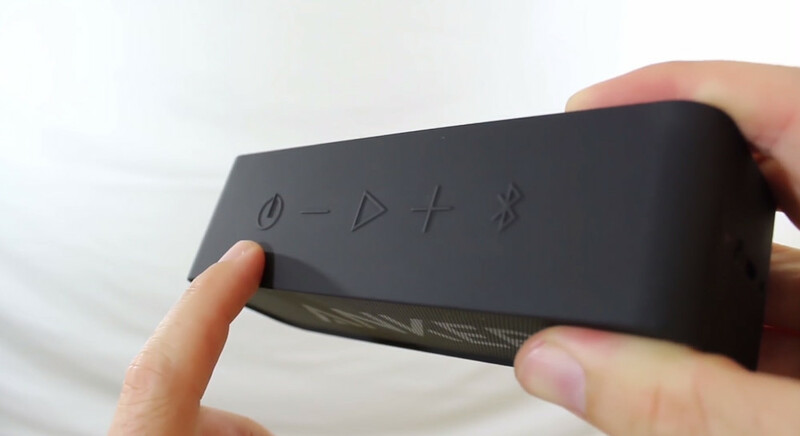 Just charge the Bluetooth speaker for 5 hours at 5V/ 1A and the power will take you 24 hours of playtime. The speaker’s battery life destroys the competition. The speaker has high quality and superior sound. It has a passive radiator which acts as a bass boost. The volume and track controls are easy to use, and they are situated strategically. The lows are on the quality level what you expect from a speaker of this size, the mids are nice and smooth and the high end in the SoundCore definitely had some harshness at max volume, but you will be surprised how loud this little speaker can get with a minimal distortion at high volumes. The SoundCore came along with a micro USB charging cable and a manual. The booklet of this speaker contains instructions on how to use the speaker and warranty information. Sometimes happens you need to restart the speaker, this is an easy task with Anker´s SoundCore. It is also easy to reset the speaker. All you need to do is to long press “BT” button for two seconds when the speaker is in standby mode. It deletes all the previous pairing records. The Anker Soundcore is without a doubt one of the best speakers you can get if you are on a budget. This speaker has a very long battery life and seems durable and the sound performance is decent at full volume. Overall this is a great speaker for the money. Check out the Anker SoundCore Bluetooth Speaker price on Amazon.